Regiment: Canadian Army Medical Corp; 3rd Canadian General Hospital . Fleck Graham was a Canadian doctor who died from the effects of exhaustion after the hospital in which he was working was bombed in an enemy air raid. Thomas Fleck Graham (known to his friends as “Flake”) was born in the small town of Guelph, near Toronto in Ontario, Canada on 30 August 1884, the fourth of seven children born to Alexander Graham (c.1840–1905) and his wife, Ellen née Craig (1854–1931). Alexander Graham was born in Scotland in about 1840 and emigrated to Canada in 1871, where he worked as a gardener. Within a few years of his arrival in Ontario, he married local girl Ellen Craig, 14 years his junior. Between 1875 and 1890, the couple had seven children (three girls and four boys) and settled in Brantford, 100 km south-west of Toronto. Fleck attended St. Andrew’s Presbyterian Church in Brantford, and was educated at Brantford School and the Brantford Collegiate Institute. Between 1909 and 1914, he was at the University of Toronto, from where he graduated as a Bachelor of Medicine in 1914, before attending a post-graduate course in New York. On 19 September 1917, while stationed at Seaford, he was initiated into South Saxon Lodge No 311, meeting at Lewes. He was initiated alongside another soldier, (Sergeant) Harry Akers. Both men were passed to the Second Degree on 17 October and raised to the degree of a Master Mason on 21 November 1917. Harry Akers (1883–1947) served with the 49th Battalion (Edmonton Regiment), CEF and survived the war, being discharged from the army in May 1919, with severe bunions. In late 1915, Fleck enlisted at Hamilton, Ontario, joining the 86th (Machine Gun) Battalion, CEF. The 86th Battalion, which claimed to have been “the first of its kind in the British Empire”, had been raised at Hamilton in August 1915, by the prominent Hamilton architect and Major in the local 91st Highland Regiment, Walter Wilson Stewart. By late September, when the battalion’s strength was approximately 1000 men, they set off for a training camp at Niagara, where they were stationed for just over a month, before returning to Hamilton on 9 November. Now stationed at the Old Armouries in Hamilton, the battalion continued training, with drill and route marches. Much to Major Stewart’s annoyance, it was not until March 1916 that the battalion finally received a supply of machine guns enabling to start training in their use. The battalion was sent to England in May 1916. 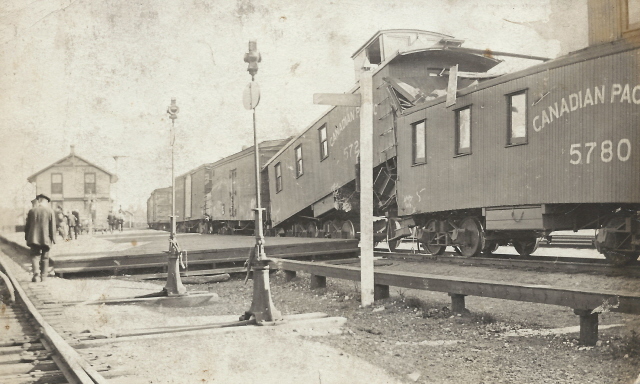 On 7 May, on his way to join up with the battalion prior to departure, Fleck (who had been appointed the battalion’s medical officer in January) was seriously injured in a train crash at Sharbot Lake on the Kingston and Pembroke branch of the Canadian Pacific Railway. He received injuries to his back, which caused him to spend several weeks in hospital in Hamilton, following which he had to wear a Plaster of Paris cast for over a year. By the time that Fleck was considered fit to travel, the battalion was already in England. He sailed from New York on board the American Line’s SS St. Louis, arriving at Liverpool on 30 July, before being re-united with the battalion at Risborough Barracks at Shorncliffe near Folkestone in Kent. By now, the 86th Machine Gun Battalion had been re-designated as the Canadian Machine Gun Depot (CMGD). While en route from Canada, Fleck was appointed a temporary Captain and posted to the Canadian Army Medical Corps (CAMC), being officially appointed Medical Officer to the CMGD on 18 September. In January 1917, he was posted as assistant to the Deputy Assistant Director of Medical Services (DADMS) at Hastings and then at Crowborough in February. On 21 July 1917, he was again transferred, this time to the CAMC headquarters at Seaford. While at Seaford, on 7 August 1917, he was “brought to the notice” of the Secretary of State for War for “valuable services rendered in connection with the war”. On 1 April 1918, he left Seaford and was sent to Shorncliffe en route for France, where he arrived on 4 April, reaching the No 3 Canadian Stationary Hospital at Doullens on 9 April 1918. 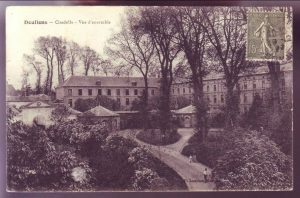 The No 3 Canadian Stationary Hospital had been established in the citadel just south-west of Doullens town centre (at 50°09’06.0″N, 2°20’05.0″E) in mid-November 1916, taking over the premises formerly occupied by the 35th Casualty Clearing Station. The hospital occupied all the buildings within the citadel, including the chapel. The hospital was extremely busy, dealing with casualties from the Spring Offensive, especially the German Operation Michael, which pushed the front line back from St. Quentin to within a few kilometres of Amiens. In the month of April 1918, the hospital admitted (and discharged) over 15,000 patients, at the rate of 500 per day, including a large number of men affected by gas. On 19 April, less than a fortnight after his arrival at Doullens, Fleck was sent on temporary duty to the 21st Casualty Clearing Station at Auxi le Chateau, about 20 km north-west of Doullens, where he remained until 5 May. The hospital war diary reports an increasing level of enemy aircraft activity over the town in May. On the night of 29/30 May 1918, the hospital was attacked by enemy aircraft. 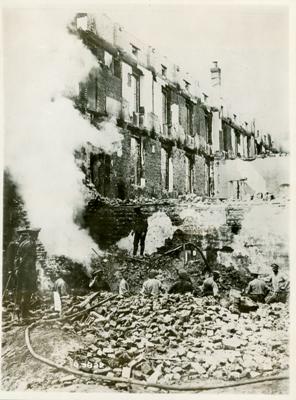 At 12:25 am, the first bombs were dropped, one hitting the main building, destroying the sergeants’ quarters, an operating theatre and X-Ray room. Fire broke out threatening the entire upper section, and the nurses and doctors worked heroically to move the patients to safety, and combat the fire. There followed a second attack, but this time no further damage was done, despite the aircraft firing at the staff and nurses as they were attempting to evacuate the wounded. 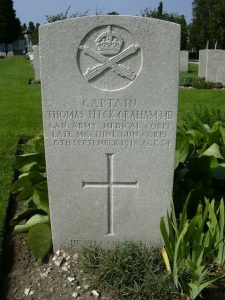 Three surgical teams were on duty that evening but two, including Fleck Graham, had completed their operation and had gone for their midnight meal. All members of the other team and their patients were killed in the initial attack. The night was clear and bright. There should have been no difficulty in the airmen recognising it as a hospital. The plane is stated to have been at a height of about 6000 feet. The hospital is well marked with red crosses which airmen say are quite visible from the air. There is no doubt that the occupants of the aeroplane knew it was a hospital for when they came back and dropped bombs a second time, the flames clearly illuminated the red crosses on the buildings. This hospital, being in the Citadel, is surrounded on three sides by fields and on the fourth by a French hospital. There were no camps of troops or dumps of any description in the vicinity of the hospital. The hospital after the bombing. The funerals of the casualties of the bombing (2 doctors, 3 nurses, 16 auxiliaries and 11 patients} were held on 31 May at Bagneux Cemetery, Gezaincourt, 2 km to the south-west of Doullens. 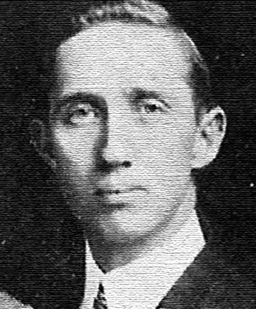 One of the doctors who was killed, Captain Ethelbert Eldridge Meek (CAMC), was the room-mate of Fleck Graham, who lost all his personal effects in the fire. The hospital resumed its activities the day after the funeral, and in July 1918, Fleck Graham was in charge of the Resuscitation and Wounds of the Chest wards, where the hospital diary records that he continued to “work indefatigably”. On 14 August, however, despite the objections of the officer commanding the hospital, Lieut-Col. Clifford H. Reason, the hospital was closed, with the patients being transferred to the Casualty Clearing Stations at Gezaincourt and the staff being sent to recuperate at Rouen. On 1 September 1918, Fleck was temporarily posted to the No 5 Canadian General Hospital based at the racecourse in Rouen. 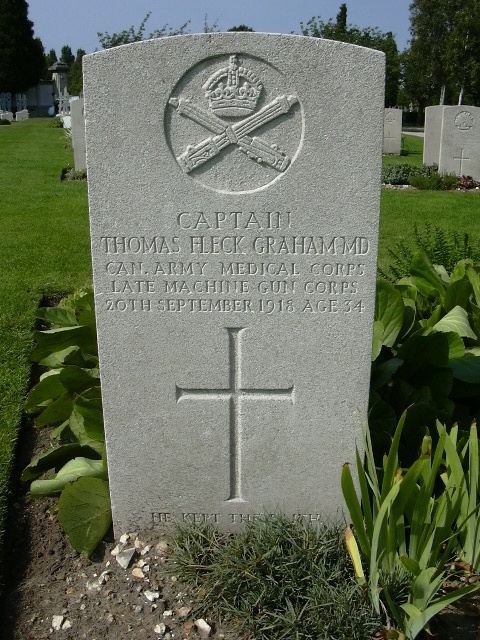 On 13 September, while at No 5 Hospital, Fleck Graham was taken ill with the symptoms of exhaustion and was transferred to No 8 British General Hospital, where he died a week later, on 20 September. The official cause of death was cardiac failure brought on by pulmonary tuberculosis. He was buried the following day at St. Sever Cemetery in Rouen. The funeral service, conducted by Revd. Captain Kennedy, chaplain, was attended by the entire staff of No 3 Hospital; the band and firing party were provided by the South Wales Border Regiment. His grave, at plot “Officers, C. 8. 1”, bears the inscription, “He kept the faith”, which was paid for by his eldest sister, Mrs. Jennifer Garvack, and the insignia of the Machine Gun Corps. Another bright, young promising Brantford life has been added to the terrible toll of the world catastrophe. Captain Thomas Fleck Graham has made the great sacrifice. “Flake” Graham … had friends everywhere throughout the city and county. In writing home, Captain Graham was ever most cheerful of all things. In one letter, he expressed the belief that, if he met the almost inevitable death in France, he felt that he had been of use to humanity just as much as if he had returned and lived to be an old man. That was the spirit of his service. Fleck was always a popular favorite, and prior to his going to college, he was a popular figure every Saturday on the Brantford market. On behalf of myself and staff, I would ask you to accept our deepest sympathies in your great loss. You have lost a son of whom you may indeed be very proud and, as Commanding Officer, I have lost a very valuable officer and personally one whose friendship I valued very highly. While with us, by his deep devotion to duty, he endeared himself to all the patients who were fortunate to come under his care and, by his cheerfulness and kindly thoughts for others, he became a general favorite. At all hours of the day or night and with complete disregard for personal safety when the Hun planes were overhead and threatened to drop bombs, he carried on his work so successfully that many soldiers, whose life might be said to hang by a thread, were saved and the patients subsequently returned to their homes in England. When he was taken ill, I was in England. Immediately on my return, I called on him. He was quite cheerful and seemed to be making good progress. He spoke about returning to his work to which he was looking forward with great pleasure. Dr. Graham went to bed exhausted from the work of the recent drives. When the nurse visited him at four a.m. he appeared stronger, but when she returned two hours later, he was dead. Fleck Graham was commemorated on memorials at St. Andrew’s Presbyterian Church in Brantford and at the Brantford Collegiate Institute, as well as on the Brantford war memorial. Guelph was the birthplace of John McCrae (1872–1918), who wrote the war memorial poem “In Flanders Fields”.